It felt as if his stomach was turned upside down. For Jason, magic was a new and exciting experience, but when the Magic Instructior cast his teleportation spell, he felt the world spin faster and faster until it had become a horrendous smudge of color. He quickly leaned on one of the nearby trees for support. After a few minutes, his head began to clear but the sickness in his belly remained. He staggered to a fountain nearby and drank deeply; his stomach accepted the cool liquid greedily. From a distance he heard someone call out "Damn noob". The word was alien to him and so he didn't give it much thought. As his stomach stopped rolling, he stood up and looked around. To his amusement, there was another person leaning on the same tree he was earlier, looking as sick as he had. He felt the sun was beating down on him and judging from its position, Jason guessed it was around noon. He suddenly realized he was hungry, it had been hours, (or was it days?) since he had last eaten. Time was impossible to tell on Tutorial Island. Directly in front of him stood what could only be Lumbridge Castle. Its walls seemed to reach up to infinity. On the very top of the castle, Jason could see massive cannons looming luminously; ready to defend the castle had it been under siege. No army in a hundred years has dared to enter the Kingdom of Misthalin, let alone attack Lumbridge. A massive door stood at the entrance of the castle, built from fine oak by master craftsmen. Jason had heard that it was the legendary owners of the crafting guild who had built it. The door seemed to be lined with golden hinges and handles. The sunlight reflected off of them in a shower of yellow light which warmed Jason's soul. His train of thought was interrupted suddenly by a rough shove from the side. Jason fell to his knees, scraping them. He looked up to find a large man walking towards the castle. He was wearing armor black as night, with a massive sword at his side that was as long as Jason's height. The man was built like an ox, his broad shoulders fitting tightly into his plate mail. Enraged at the attack this man has landed on him, Jason drew his bronze long sword from his side and got up to strike back at him when a firm hand fell upon his shoulder. He turned around to find a gentle face greeting him. "Let it go", she told him quietly, "Saradomin shall give him what he deserves". Jason would have went after the man had it not been her eyes, they were blue as the ocean. He was held within them, hypnotized by them. "And besides", this stranger whispered in his ears, "He could have squashed you". This broke Jason out of the trance he was in. He was now angry and humiliated. He was annoyed by her statement but he knew it was true. The man had been ranked a level 40 where as he was only a level 3. Jason got to his feet, cringing at the sting of his scraped knees but that seemed pale in comparison to his now ruined pants. He finally noticed the stranger was ranked a level 37 which put his rank to shame. She had long, golden hair which flowed down her back, covering most of the chain mail she was wearing. It was either iron or steel, he couldn't tell which. She was slightly shorter than him, although she was wearing thick and high boots. He was shocked to find that she was around his age, if not younger, yet she had a commanding look to her. Perhaps she had been in the military, or perhaps she was the daughter of a general. The latter made him uneasy. She had a fair face, which reminded him of a friend he had grown up with back in his home in Hillsfert. Instantly, he was struck by a strong wave of homesickness. At that moment, he wanted nothing more than to go home and see his family again. To hear his sister's laugh or to wrestle with his brothers. But it was too late now, it was his decision to come here and he was going to stick by it. "I'm Amber" the stranger inquired as she struck out her hand. "I'm Jason" he replied while he took her hand and shook it. "I'll have to get going now, I'm already late" Amber said as she looked down at a small round object she took out of her pocket. "If you need anything, just use the gem you got off of Tutorial Island." Jason rummaged through his backpack and fished out a small black stone. Its smooth surface gleamed in the midday sun. Jason turned it over in his hands, felling the cool and smooth surface. Carved into one side was the letter P and on the other side was the letter M. Jason didn't understand what the letters meant, but he did remember how to use it. The Quest Instructor had taught his lessons well. "I must be going now, if you're hungry, head into the castle and find the cook. He is very kind towards newcomers". Without another look, Amber turned and left, disappearing quickly through the crowd. Jason's stomach rumbled an angry sound. He now realized he was starving. He had a few coins, but looking around, he saw no vendors. So he decides to take Amber's suggestion and headed towards the castle. Two guards stood by the entrance, but they said nothing when Jason approached the door as they understand that Cook usually helped newcomers and welcomed them to his kitchen. As Jason stepped through the door, he was astounded at the marvelous architecture that even put the grand church in his village to shame. Black and white tiles lined the floor. Painting upon painting lined the walls; some of landscapes, others of the king. Between every two paintings stood a suit of armor. Jason has always wondered if someone was hiding inside when he spotted one of these. The castle was a maze; three passages opened before him and he hadn't the slightest clue where the castle cook resided. Luckily he was greeted by a friendly looking servant named who introduced himself as Hans. He wore a simple red shirt and comfortable green pants. "Hello, what are you doing here?" asked Hans. "I don't know, I'm lost, where am I?" replied Jason honestly. "Why, you're at Lumbridge Castle of course". A look of amusement crept across the servant's face. "Well, I know that. I meant, where in the castle? I would like to see the cook." Jason exclaimed. "Ah, bet you're hungry right? I heard they give you nothing but chicken feed on Tutorial Island." Hans chuckled. Before Jason could reply, Hans was walking straight towards the corridor in front of the castle entrance. Hans lead the way, first entering what could only be the dining hall. Again, Jason was amazed. A huge table stood in the center of the room, surrounded by satin covered thrones while delicate china plates lined with blue designs were placed atop them. "Why, a banquet could be eaten from this" Jason thought silently to himself. Before he had a chance to see more, Hans took a left turn and entered the kitchen. "Here you are" He grunted, and left through an adjacent door. The room was nothing compared to the banquet hall, but Jason was equally amazed. Never in his life had he seen a working sink that brought water with the twist of a handle. In his village, all of the water was drawn from the village well. Cooking shelves lined the walls, filling the room with the aroma of a hundred different scents. To the right stood a piping hot range, a pot of stew cooking on top. In the center of the room lay a trapdoor, to which Jason can only guess led to the basement where more herbs and spices were stored. And above the trapdoor stood the one and only, Lumbridge Cook. The Cook had tired black eyes. He looked as if he hadn't slept in days. He had graying hair which matched the color of his moustache. He wore flushed colored pants and a black blouse. Over his clothing was a long stained apron that reached from his neck to his knees. Perched atop his head was a chef's hat. It looked quite silly to Jason. Jason's stomach growled loudly but the cook didn't seem to hear. He had to eat soon or he feared he was going to pass out. "Erm, excuse me sir" Jason called out quietly. The cook didn't seem to hear. Instead, he rummaged through his drawers, looking impatiently for something. "Hello there sir" Jason said more loudly. The cook spun around, seeing Jason for the first time. "Oh hello" He replied. "I'm sorry, but it's not a good time for a chat, please leave the tomatoes by the sink." "You must've confused me with someone sir, my name is Jason, I'm new to the world of RuneScape." Jason said. "Oh, my apologies then, but I still have no time for chit chat, I'm very behind schedule", replied the cook. He seemed to be agitated now. "I'm sorry to disturb you sir, but do you perhaps have something to eat? I'll pay you if you wish." Jason asked. In truth, he didn't want to pay. He counted the coins in his pocket, and found he only had 25 gold pieces. A month's profit from the farm his family had given him as a farewell present. "Huh? Oh that's quite all right, there's half a meat pie on the table behind you, help yourself." Cook stated uninterestingly. He was now heading down the trapdoor. Jason turned around and found an entire meat pie with a slight sliver cut off on one edge. The pain in his stomach took over, he plunged into the pie. The taste was wonderful, he had heard Lumbridge had the finest beef in all of Misthalin, perhaps even RuneScape. This is due to the two huge ranches in the city where the cows were supposable fed wine to soften up their muscles. Within a few minutes, the pie was entirely gone, along with Jason's hunger pains. He got up and walked to the sink, filling a jug with water then drinking deep to wash down the salt from the pie. A few moments later, the cook climbed up the trapdoor. He looked more troubled than ever. Jason thought of just leaving, but he couldn't do it after the generosity this man had just shown him. It would be extremely impolite, but something in the back of his mind told him to get out. Instead, he walked over to the cook. "What's wrong?" Jason asked. The cook did not seem to hear; instead he went back to his task of searching through the countless shelves placed around the kitchen. Jason tapped the cook on the shoulder. "Huh?" replied a startled cook "Oh yes, there's half a meat pie on the table." The cook went back to searching. "What am I to do?" Jason heard the cook whisper to himself. "What's wrong?" Jason asked much louder this time. "Huh?" the cook replied while spinning around, "Oh, it's nothing to trouble you with, but ooh dear I'm in a terrible mess. It's the Duke's birthday today, and I meant to be making a big cake for this evening" the cook replied with a long face. "Unfortunately, I've forgotten to buy some of the ingredients. I'll never get them in time now. I don't suppose you could help me?" What was Jason to say? He had to agree, this man had fed him when he was hungry, the very least he could do was to try and help this man. "How can I help?" asked Jason in his most sincere voice, although deep down he wanted to explore this new land rather than help this strange man. "Oh dear oh dear, I need flour, eggs, and milk. Without them I am doomed" cried out the cook. He was on the verge of tearsnow. Jason gave assurance to the cook that he would get the necessary ingredients before sun down. He set out immediately, almost losing himself inside the castle on the way out. Luckily, Hans was there to save him again. Jason had to work fast, it was only a few hours before night and this was a foreign land to him. In the distance, he saw a building with a pot shaped sign hanging on its side. Jason instantly recognized it as the symbol of a general store. "Perfect" he muttered to himself. "Damn noobies talking to themselves now" exclaimed a passer by. Jason realized the word was meant to offend, but he didn't care. It meant nothing to him. Jason enters the general store to find it packed with housewives picking up last minute supplies before dinner. He had to shove his way through the crowd just to speak with the shopkeeper. "Can I help you at all?" asked the shopkeeper. He was an old man, perhaps the age of the cook. Neatly comber gray hair covered his head. "Yes please, what are you selling?" replied Jason. Jason was shown a display of everything in stock within the store, which wasn't much. This greatly disappointed him. Almost everything was already purchased by the noisy housewives. A few buckets and jugs remained and what looked to be a rolled up scroll. "What is this" asked Jason as he pointed at the scroll. "It's a newcomer's map, issued by the RuneScape Council to all new citizens, only 1 gp" But with only 25 coins in his pocket, Jason wasn't so sure. One gold piece was enough to buy an entire day's meal back in Hillsfert He bought it nevertheless, knowing it'll be needed to find the necessary ingredients the cook wanted. "Here you go" he said as he handed the coin to the shopkeeper. "Thank you" replied the shopkeeper while handing Jason one of the maps. "Thanks" said Jason as he headed out the door. As he exited the store, he unrolled the map to find it no help at all. It was a map of all of RuneScape. He had hoped for just a map of Lumbridge, where he could perhaps find the nearest farm and purchase the needed items. Jason was now overwhelmed, the sun was moving west fast and he hadn't one single ingredient yet. He thought of just leaving the cook, and was shot by a strong sense of shame. He looked around and found a tall man leaning against a nearby tree. He approached the man, hoping for directions. "Hello" greeted Jason. "Hi" the man replied. He was wearing an orange split colored shirt and matching pants. He had brown hair and blue eyes that reminded Jason of Amber. "Can you direct me to the nearest farm? The cook of Lumbridge Castle has sent me on a sort of quest" Jason said. "The cook of Lumbridge Castle?" asked the man. "He happens to be a close friend of mine, what do you need?". "Well, it's what the cook needs, and it's an egg, milk, and flour." replied Jason. "Hell, I was just heading over to Alian's farm anyways, come on I'll show you." So they headed north, the man in the lead. "I'm Pete by the way." The man said without looking back. "But my friends call me Em." "Nice to meet you Em, I'm Jason of Hillsfert." They turned east onto a bridge. Jason could see ducks swimming in the river. "Hillsfert? Never heard of it" responded Em. They headed north until a chicken farm came into view. "Over there" grunted Em. Jason walked up to the man Em pointed at, a middle aged farmer standing in the middle of his chicken coop, pitchfork in hand. "Hello, do you have any eggs, milk, or flour?" asked Jason. "Yeap" replied the farmer. "Eggs a coin each, milk you can have for free as long as you milk them yourself. I'm a bit behind today so I haven't had the time to cycle through my chores, they're over yonder." The farmer pointed behind Jason at a bundle of ranches. "Third ranch from the left is mine, as for flour you'll have to get over by the windmills." "Alright, I'll take one egg then." The farmer hands Jason an egg in exchange for a coin. Jason watched the coin go with grief. He rejoined Em, telling him what the farmer had said. "Alright, let's go milk us some cows." They headed towards the cow pens as Jason rummaged through his backpack for the bucket he was given on Tutorial Island. He finally found it sitting next to his short bow. It was true, the farmer had truly slacked off. The cows were bursting with milk, if they were not milked soon, they would explode. Jason chose the closest one and milked the cow with ease, bringing back another wave of homesickness. He remembered milking the cows at dawn with his dad, smelling the hay and sweet dew. Jason shook his head vigorously to rid his mind of these thoughts. "You alright?" asked Em. "Yeah, just fine" replied Jason in a very tired voice. "Do you know where the windmill is?" Jason asked as he hoisted the milk up and placed it into his magical backpack. Only one of these backpacks are given to each citizen of RuneScape, it could hold 28 items of any size. "Yeah, it's not far from here." They set off again, crossing the bridge and passing the general store. The sun was nearing the horizon. As they walked, an ugly green creature crossed their path. From his studies, Jason recognized it as a goblin, only a level 5 creatures but still vicious in packs. This one was holding a spear, making it extra deadly. Jason quickly drew his bronze long sword and put himself in a defensive position as taught by the combat instructor. "Put that aside" He heard Em say. "They wouldn't dare attack anyone in Lumbridge" Jason obediently sheathed his sword, feeling quite foolish now that he realized other people roamed the grounds among the goblins. Of course the goblins wouldn't attack anyone this close to Lumbridge Castle, with so many city guards around. Shortly after, the two adventurers came upon a wheat field. Seeing no one around to ask for the grains, Jason went in a picked some himself. He had no time to waste with nigh approaching so quickly. Em had no objection to this, in fact he had a sheepish look on his face as if he picks wheat grains from this plot of land without permission as well. They continued north and not long after, they came upon the windmill, its sails rotating lazily in the evening wind. Em opened the large doors and climbed up the ladder, Jason followed after. On the top floor stood a large, metallic machine. Upon examining it, Jason found it to be a hopper. He guessed it must be to grind wheat grains into flour. His dad was always the one who went into town to grind their grains so Jason didn't know how to work the machine. Em understood this from the confused look on Jason's face and so he took the wheat grains from Jason. "Here" he said as he put the wheat grains into the hopper, and then pulling a lever at the hopper controls. Jason heard machinery activating below him and the sound of grain sliding down the chute. They climbed back down to find a pile of finely grinded flour at the base of the chute. Jason searched in his pack for a pot to store the flour in. He thought he had lost it when he finally spotted it hiding behind the map. He quickly swooped up the flour with the pot. "Well, I think that's everything" said Em. "I must be going now; I'm having dinner with a friend. Give Cook my best." Without another word, Em turned and left. PM me if you need anything else he called back over his shoulder. "Thanks" Jason cried after the already dimming form of Em. He was fairly excited now. All of the ingredients were now in his possession. With a smug look on his face, Jason headed back to the castle. Streams of people were heading into the Castle when Jason arrived. Two different guards stood outside of the castle doors, taking invitations. Jason felt uneasy. He realized these were the guests for the Duke's birthday celebration. He walked up to the door, trying to blend in. A harsh hand came down on his shoulder. Jason turned to find the scarred face of an annoyed guard who seemed ticked for being assigned such a pointless position. "Name?" The guard said harshly. "I'm here with ingredients for the cook." replied Jason. "A noob like you? Push off squirt." "It's okay, he's with me." said a familiar voice. Jason looked over the guard's shoulder to find Hans rescuing him once more. The guard mumbled something under his breath which sounded a lot like issant. Jason thanked Hans as he was rushed to the kitchen by the servant. "At last, do you have the ingredients?" the cook asked with high hopes in his voice. "I now have everything for your cake. Milk, flour, and an egg." replied Jason. "I am saved, thank you." the cook whispered with relief in his voice. "Come now" Hans said while pushing Jason through a different door. "We must leave the cook to his work. There's a bed upstairs if you wish to spend the night, here take this." Hans handed him an entire meat pie along with a jug of wine. He then left Jason to his own. Jason never realized how exhausted he was until now. He found an empty room upstairs with a simple but comfy looking bed. He washed down the meat pie with the jug of sweet tasting wine. Setting the empty jug and pie-tin on a nearby table, Jason flopped down into the bed and was asleep instantly as his head hit the soft pillow. It had been a long day in RuneScape. The sky was a clam blue. The smell of morning dew filled the air. The view of the woods was excellent. Julia. She was by his side. She smiled at the picnic he had set down, a smile that melted his heart. There was a sound in the distance; hoof beats. It was coming towards their direction. The sound grew in intensity. A man slumped over a horse. Was he alive? Multiple arrow shafts pierced his body. The stranger moaned. The cabin. Julia cared for the wounds. The stranger tried to say something. Darkness. He awoke, the pain exploding in the back of his skull. Julia was gone, and the stranger as well. The cabin door stood ajar. It was night outside, the moon hung pregnant in the dark sky. Her shoe, it was at the edge of the forest. Footsteps, where was it coming from? Oh god, a trail of blood. Her engagement ring glittered by a patch of grass. A crude alter up ahead. A body on the stone surface. Oh god, it was Julia. The blood, it was everywhere. Her throat, it was still bleeding. His vision grew blurry, his knees felt weak. Darkness. The scream filled the small, musty room. Jason awoke to the sound of his own terror. He sat straight up in bed, feeling the sweat that drenched his entire body. His stomach rolled like waves in the sea, and his lungs seemed to be blocked by an invisible force. The panicked adventurer grappled blindly for the small table by the bed, finally finding the empty pie-tin he had set there the previous night. Leaning over the bed, he heaved what remained of his dinner into the empty dish. The smell of sickness filled the room, which caused Jason’s stomach even more havoc. Finally, after several minutes, his stomach emptied, yet Jason continued to heave dryly; unable to control the convulsions from his belly. The nightmare playing over and over in his mind did not help getting himself under control. When he was finished, he set aside the now half full pie-tin and fell backwards onto the bed exhausted. The nightmares were coming to him more frequently, and each became more vivid as the days passed. When he felt he could stand, Jason got up and exited the room, carefully avoiding looking at the pie-tin for that may cause his stomach to churn again. He found the wash a few doors down from his room; a small, clustered chamber with a rancid porthole and a dirty sink. Jason imagined this to be where the first year guards came to relieve themselves, thus the horrid condition it was in. Nevertheless, it was the best he could get at the moment, and he was grateful for that. Jason took one of jugs stacked along the single shelf in the wash and filled it with water from the sink Again, he was amazed at the technology in RuneScape. He poured the contents of the jug over his head and washed out his mouth with what remained. Despite doing this several times, Jason could still taste the bitterness of his stomach’s content. He headed back into his room and brought back the pie-dish with him; the contents turning a putrid yellow. He quickly disposed of it in the porthole. Back in his room, the young adventurer dried himself with the bed sheet. He quickly dressed, wishing to leave the room as soon as possible, hoping to leave the nightmare with it as well. Back downstairs, he decided to bid farewells with the cook. Jason headed into the kitchen, only to find the master chef snoring in the far corner of the kitchen, his face covered with flour. Jason smiled at the scene before turning and departing from Lumbridge Castle. The first hints of dawn shown in the sky as Jason advanced past the gates. To his left, he saw Hans tending to the flowers while humming a merry tune to himself. Even this early in the day, the streets were already filled with travelers from all over the world, most were newer ones fresh off Tutorial Island. Jason started walking among the crowd, hoping to find a tavern nearby for information only to be stopped by a tug on his sleeve. He looked down to find a child no older than twelve leading him to an alley. Before they went any further into the deserted alley, Jason tore free of the child’s grasp with a hard jerk of his hand, causing the child to go fumbling towards the ground. The child didn’t seem to mind his harsh fall and simply rose from the ground and patted the dirt off the rags he wore. "What do you want?" demanded Jason in a stern tone. With a big smile of his face, the child replied, "Trim yer weapon for ye sire?" The child’s Misthalin accent was so thick that it took a few seconds for Jason’s mind to register what he had just been asked. For the first time, Jason noticed how thin the child was. His hands seemed nothing more than skeletal claws and his cheekbones sunk in so much that Jason swore he could count the teeth in the child’s mouth. The child wore nothing but dusty rags which have been patched over so many times that it was impossible to tell what color the cloth had originally been. "Well?" the child asked impatiently. "What about it?" Curious about the offer and wishing to learn more of it, Jason decided to see inquire more on the matter. "What’s your name, child?" Jason asked. "Dansky sire." replied the child. "Me name’s Dansky." "Alright then Dansky," Jason said. "Now tell me, what’s trim?" The child stared at Jason as if he had grown a second head. "Why, it’s what yer weapon needs in order to slay those monsters that dwell in those swamps and mountains. Sure you can kill a goblin or two with that weapon of yers," the child said while eyeing Jason’s bronze long sword, "But if ye want to slay the big monsters, yer weapons needs to be trimmed." "How is it that a squirt like you knows how to trim weapons?" asked Jason suspiciously. None of the instructors on Tutorial Island had said anything about trimmed weapons. "My uncle taught me" replied the child. "I lived with him until a month ago when a fire started in his house while he was a sleeping. It was a quick death for him, bless his soul, but the fire left me homeless so I’m saving up to buy a cabin by trimming weapons for people. I’m awfully cheerful today, so I’m only charging twenty gold a trim. How bout it?" A big, friendly grin spread across Dansky’s face. "Twenty gold?" Jason laughed. "No thanks kid, I had thought that it was for free. Besides, I hardly believe that story you told on trimmed weapons; it has more holes than that shirt you’re wearing." Jason began to leave the alley only to have the child step in his way. "Alright, since you seem like a nice enough guy and I’m in such a great mood, I’ll trim it for free. Just hand me that weapon yer carrying." Still very suspicious about the offer, Jason posed to stop the child if he tried anything funny as he unlaced the sheath containing his bronze long sword and handed it to the child. Jason had heard too many stories on Tutorial Island about situations like this one that left the unsuspicious looted of their hard earned gold. The child looked over the sword; holding it at eye level and then feeling its balance. "I’ll be needing me tools." the child announced as he reached into his pocket. In a flash, the child threw some sort of pocket sand into Jason’s eyes with a speed that the young adventurer didn’t think was humanely possible. Jason sank to his knees as he attempted to wipe away the sand with one hand while blindly grappling for the child with the other. Luckily, he caught the collar of the rags Dansky wore just as he was attempting to escape. "Let me go" Dansky yelled as he struggled to tear free, but Jason’s strength outmatched that of the child’s. With grim satisfaction, Jason pulled the thief closer to him. He held onto the collar with one hand while he wrestled for his weapon with the other. Without warning, pain exploded in Jason’s shins. He had expected the brat to try something like this, but hadn’t believed he could kick with such force. Jason released his grip, bending down to tend to his injured leg. Not only had Dansky damaged his leg, but he had also left a deep gash on it as well. "Hahaha noob" the child shouted over his shoulder as he ran deeper into the alley. Looking up, Jason saw Dansky disappearing around a corner, at the same time noticed the spurs on the back of the child’s boots. No wonder the wound on his shin had been so deep; the brat probably wore spurs just for situations like this one. Cursing himself for being such a fool, Jason tore a piece of his shirt off to wrap around his injury. Upon further inspection, the gash had not been as deep as he first believed. Already, the blood flow was slowing and the pain had reduced to a dull throb. Nonetheless, he now needed a new shirt, a pair of new pants, and a new weapon. Thinking of the last made Jason very uneasy. It was definitely not wise to travel in a new land unarmed. Even more, Jason finally noticed how dark it was in the alley. He quickly scrambled outside into the safety of daylight, knowing that many have perished behind alleys on dark days. He winced at the pain with each step he took, yet he didn’t want to waste what remained of his gold on a healer. Checking his pack, the only weapons the young adventurer now had was a woodcutter’s axe and a small dagger; definitely not the appropriate protection one should have in this new land. Even so, Jason quickly strapped the dagger to his wrist and then the axe to his back. Jason thought of reporting what had transpired in the alley to one of the castle guards, but then thought against it for the chances of them finding the brat was slim to nil and he didn’t want to be humiliated again. Instead, Jason rummaged through his pack until he found the newcomer’s map he had bough the previous day. He hoped to find a weapons merchant someplace nearby as he began to unroll the scroll. But instead of the map, he had found a new document that had not been there before. It appeared to be a certificate of some sort. Under the light morning sun, Jason read the parchment. 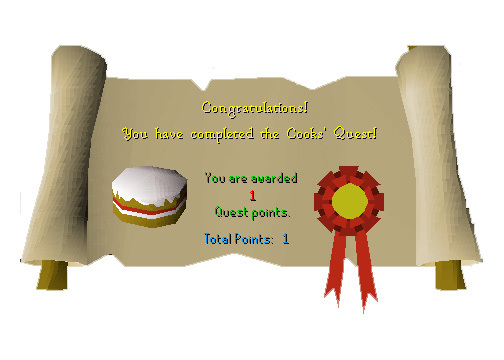 "Thank you, young man, for helping the cook of Lumbridge in a quest for the cake’s ingredients. Feel free to use my kitchen for any of your cooking needs. I am forever in your debt. Sincerely, Alford LeBret. Head Cook of Lumbridge." In the lower-right hand corner, a red ribbon was pinned onto to parchment. Jason smiled as he rolled up the certificate; returning it to his pack and withdrawing the newcomer’s map. Hans must have snuck in the scroll while he was sleeping. Chuckling to himself, Jason unrolled the newcomer’s map and studied the surroundings of his location. He noticed there was no sword shop nearby, but there was an axe shop positioned not far from where he was. Lowering the map, Jason could actually see the building directly ahead of him. He began walking towards the shop as he returned the map to his pack, wondering how he could have missed it earlier when it was only a few scant meters away from him. He would have much preferred a sword as he barely had any training with a battleaxe on Tutorial Island, but it’ll do for now. Jason quickly made his way to the shop. It was a simple building built of oak and maple. A large sign with the picture of a fearsome battleaxe hung loosely above an open door. Upon entry, Jason was greeted by the owner of the shop; a huge, dark skinned man who introduced himself as Bob. Battleaxes were carefully strapped to the walls of the building; some were even behind glass in fancy display cases. The words "Break glass in case of emergency" was carved into the frame of one of the cases. The shop was empty save Jason and Bob, which caused Jason to question the quality of the shopkeeper’s wares. Surely many adventurers would come seeking new weaponry at Bob’s Axes since it is located so close to Lumbridge Castle; the location where all who finished their training on Tutorial Island is teleported to by the Magic Instructor. But what other choice did he have? He couldn’t travel all the way to Varrock just to purchase a sword. "I’m in need of a weapon," Jason told Bob, "Something sturdy and effective but not too expensive." "Well, you’ve come to the right place my friend," replied the huge man, "Here at Bob’s Axes, you’ll get the best merchandise at the lowest price. Let’s try this one shall we?" Bob went over to one of the walls and took down a huge battleaxe made of some blue metal. "Mithril, won’t find many metals stronger than this," Bob chuckled as he handed the weapon to Jason. The young adventurer took the handle, and fell over at the weight of the axe. Luckily, Bob caught him and quickly removed the weapon from his hands. Jason turned red with humiliation, but the vendor didn’t seem to notice. With a frown on his face, Bob replaced the weapon back onto the wall. "Hrm, looks like that was a little too advanced for you. Here, take this one." The dark skinned man moved to the opposite wall and took down a much lighter looking axe. He offered the handle to Jason. "If this is still too heavy for you, then I’m afraid I can’t help you with your battleaxe needs. In fact, I doubt anyone in the realm can." Ignoring the statement, Jason wielded the weapon with both hands. He found it to be heavy, but balanced for its size. He took a firm grip and swung it in a downward arc to his left as the Combat Instructor had taught him, feeling the weapon travel smoothly through the air. "Well, looks like the pup likes it," Bob said with a satisfied grin on his face. "Iron’s about five times lighter than mithril." Jason marveled at the craftsmanship. The flat sides of the axe were so smooth and polished that he could see his reflection in them. The edges seemed razor sharp as if they had just been freshly forged. The handle was wrapped with leather that seemed to have been tanned only yesterday. "I’ll take it," Jason exclaimed with a big smile on his face. "How much?" Now there was an equally large smile on Bob’s face. "Two hundred gold pieces, a real bargain for such an exquisite weapon." Jason was shocked at the price. In Hillsfert, two hundred gold pieces was enough to purchase the best plot of land in the small town. Yet here he was, hearing that a piece of weaponry costs as much as what his family made in a year. "Two hundred gold? I’m sorry, but it looks like I will not be able to afford it at that price." Jason said with a disappointed look on his face. "But perhaps I can trade in some of my other items for the weapon." "Hrm." The shopkeeper’s face tightened to a deep frown. "Well, I doubt you’ll have anything I’m interested in, but let’s have a look anyways." Jason opened up his sack, but found nothing very much of value in there. But then he remembered the dagger he had strapped to his wrist, and quickly brought it out for Bob to see. "How much will you give me for this?" asked Jason hopefully. If he could strike up enough money and perhaps haggle the price down some more, he might actually be able to afford the battleaxe. He certainly did not want to leave empty handed after having felt the magnificent power of the weapon. But to Jason’s dismay, Bob simply laughed at the offer. "A bronze dagger," the axe merchant chuckled, "Not even worth the metal its smithed from." "Well, what about this?" Jason asked as he removed the woodcutter’s axe from his back. "I have no need for those, as you can see." Bob replied while gesturing to a section of the wall to Jason’s left which was filled with bronze axes. Heaving a sigh of defeat, the young adventurer began to head out the door when he was stopped by the shopkeeper. "Wait," Bob demanded. "I have an offer for you." That captured Jason’s attention once more. He quickly turned to learn more of this offer. "If you haven’t noticed, my shop is very empty" the vendor began in a dismal tone. "This is because some trouble’s been brewing over at the church across the road. There’s been rumors going around that the graveyard is haunted by a ghoul who terrorizes anyone that comes close. At first, I thought it was just some hoodlums trying to scare up some fun, but then the Duke’s own nephew said he saw the ghost himself while praying in the church. He swore that the spirit of some long forgotten ripper had come back, demanding the souls of the innocent. Since then, six others believe they’ve seen the specter and the church’s gravedigger has gone missing." "Hmm, do you believe that the church is haunted?" asked Jason. "Not for a second" replied the dark skinned merchant. "It’s been six weeks since the rumors started and I haven’t seen anything at all. But that doesn’t matter, because others do believe and now they stay as far as possible from that church, and since my shop is just next door, people have stopped coming for my wares. Of course, the different rumors that have spread since that day six weeks ago doesn’t help either. I actually heard someone say that the Duke’s nephew saw the legendary demon Delrith rising from one of the graves. It’s nothing but dragonspit, and just between you and me, I’d bet my finest axe that the Duke’s nephew was drunk that day he saw the ghost. Psh, as if the dead can rise up and live again." Bob finished his story with a sneer of contempt, as if the Duke’s nephew purposely started the rumor to turn customers away from him. "Well, what do you want me to do?" Jason inquired. The story wasn’t sitting well with the young adventurer, especially after hearing a demon could involved. But after all, hadn’t he himself come to Misthalin in search of what could very well be a demon? "I need you to investigate and find the truth behind these rumors." Bob answered. "If you somehow end these rumors and have people returned to my shop once more, I’ll give you that battleaxe you wanted at no charge." The thought of that battleaxe in his hands removed all fears of the ghost. "Great, I won’t let you down." Jason replied eagerly. "Excellent." Bob exclaimed. "You’ll want to see Father Urhney first. He’s the top Friar at the church. I’m sure he’ll have more recent information on the ghost. He’ll help you start off your investigation." The pair exchanged farewells as Jason exited the shop. It was nearly noon now, he had been chatting with the axe merchant for quite some time. Surveying his surroundings, Jason spotted the holy church across the road to his right. Without hesitation, the young adventurer set off quickly for his destination.